Plenty of people like to think of the Tesla Model S as a massive smartphone on wheels, with its huge battery, monolithic touchscreen, and constant software updates. So to hear that Tesla has snagged more employees from Apple than anywhere else shouldn't come as a surprise. Since 2006, Apple has hired at at least 150 engineers, lawyers, product planners, retail execs, and software developers according to a report by Bloomberg. In Silicon Valley, where top tech talent has their choice of gigs, Tesla is becoming a more compelling place to work than some of the more stodgy companies and perilous start-ups, particularly given what its making and who's running it. Employees who have worked at Apple say their decision to join Tesla was based on its cars and its CEO. Musk has a reputation, like Steve Jobs did, for a mercurial temper and an obsessive attention to detail. A former Tesla worker who didn't want to be named says that Musk is enamored with Apple and relishes comparisons between himself and its co-founder. Tesla, says one Silicon Valley recruiter who asked not to be named, attracts the same kind of employees that Apple does—driven, hard-charging, and drawn to a strong leader. Other automakers that have usurped to the Valley aren't getting that kind of draw, such as Ford, which had to tout one, lone mid-level engineer hired from Apple in its press release. But taking a wider view of Tesla's workforce shows that former Apple employees only make up a fraction of a fraction of the company. 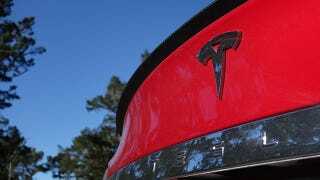 Bloomberg says Tesla boasts over 6,000 employees, but worldwide it's now over 10,000.